A year after bringing billionaire Bidzina Ivanishvili’s Georgian Dream team to power, Georgian voters barely bothered to show up for the October 27 presidential election that will end President Mikheil Saakashvili’s near-decade in office. The election is a major milestone for the tiny South Caucasus country: 45-year-old President Saakashvili, in office since 2004, completes his second and final term, becoming the nation’s first president to leave office via the ballot box rather than revolution or violence. percent of an unspecified number of respondents -- as indicative of the eventual outcome, and pledged to work with his rival "so that our country moves forward and our people live better." In a speech to supporters, Margvelashvili, flanked by the prime minister, thanked supporters, noting that their "unity" had brought about "today's victory," terming it the "free" choice of "a free nation. "Preliminary results, however, were not expected until late evening, the CEC announced. The low turnout, though, will not affect the legality of the election, according to Georgian election law. The threat of a low turnout, however, has been a worry for Ivanishvili and his allies in the ruling Georgian Dream coalition. If not a clear rejection of their policies, it suggests indifference toward what the prime minister claims are the many successes his cabinet has had in almost a year in office. Presidential candidates echoed the calls to get out and vote, placing the emphasis on moving forward, toward European integration and political stability. other stage and many new interesting things will happen,” he said. Largely keeping to the background, he postponed his trip to a downtown Tbilisi polling station numerous times before surfacing at the Black Sea resort town of Anaklia, a former pet project. Saakashvili, who is barred from a third term as president, has already announced plans to lead his party in opposition to the Georgian Dream. Appearing solo at his polling station by late afternoon, he invited journalists to join him in his apartment next-door to make a statement. “Nearly all the important projects are stopped; the country is in a condition of ‘pause,’ as we all well know. There are several tendencies that are not good for the people, as people also well know. Now we need to minimalize all this…” he said, while noting that he is “emotionally” drained and plans to take some time off. Regardless of the turnout, the election appeared to be largely peaceful. 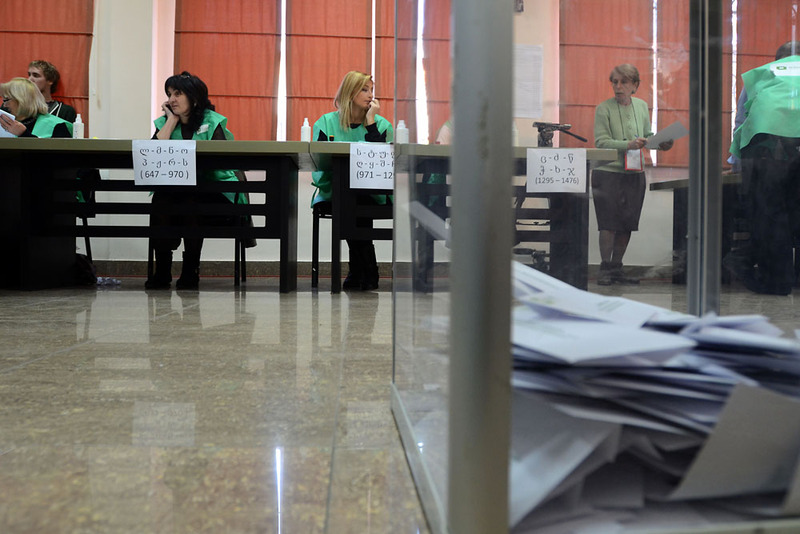 Some reports of irregularities, including a lack of ballots in some polling stations, as well as a confrontation in the parliamentary seat of Kutaisi between supporters of Bakradze and fellow candidate Nino Burjanadze, a former parliamentary secretary and ex-Saakashvili ally who favors stronger overtures to Russia.The UNM reported carousel-voting in precincts in or near Tbilisi and in Kutaisi -- an effort, it claimed, by the Georgian Dream to get out the vote. Watchdog Transparency International Georgia* reported that their 370 observers around the country had noted “more procedural violations” during the voting than had been documented in the 2012 parliamentary elections. The most sensitive problem touched on Russian troops’ ongoing erection of a fence within internationally recognized Georgian territory. Georgian citizens now trapped within breakaway South Ossetia by the fence were unable to enter Georgian-controlled territory to vote, reported Foreign Minister Maia Panjikidze; she claimed the similar case for breakaway Abkhazia. US Ambassador Richard Norland, however, applauded the overall elections as “very well organized,” noting that a peaceful and transparent vote can contribute to the consolidation of democratic institutions” in the country. The proof of that statement most likely lies in the future. Despite his strong position in opinion polls, Georgian Dream presidential candidate, Giorgi Margvelashvili has pledged to drop out of the race if a second round of voting is required. Many locals have seen the pledge, which followed comments by Ivanishvili, as an attempt to swing votes away from the UNM. Ivanishvili himself has announced plans to step down as prime minister later this month. He has indicated that his replacement will be a cabinet minister; an announcement is expected on October 29 or 30. But Georgians appeared to be unfazed by the uncertainty of the vote’s outcome, with even areas traditionally known for a high voter-turnout reporting low numbers. In Gardabani, a small town in southern Georgia renowned for active voters who support whichever the ruling party may be, voter turnout in one precinct (#21) by 2pm stood at just over 13 percent, compared to 23 percent for the 2012 parliamentary elections. Basking in Indian-summer weather, Tbilisi voters were also uncharacteristically quiet. The headquarters for all three frontrunners were largely empty, save for a few journalists and television screens. An overall lack of charisma among the frontrunners might have added to the apparent disconnect. The new, vastly reduced, role for president also could have played a role. (This story was updated at 2:40pm ET on October 27, 2013. )*Transparency International Georgia receives financing from the Open Society Georgia Foundation, part of the network of Open Society Foundations. EurasiaNet.org operates under the auspices of the Open Society Foundation-New York City. Molly Corso is a freelance reporter and photographer based in Tbilisi.